Less than a week till we visit my brother. Gas for the drive will eat most of our budget. Lodging, fortunately, is free. What does a frugal family need to know about the area around Destin, Florida? Offbeat places to shop like Mennonite markets or thrift stores? We'll be driving down I-65 through Alabama. Any advice appreciated! I wish I had some knowledge to share with you, but I want to wish you a great trip! There is an awesome state park near Destin called Grayton Beach. They have affordable cabins, which are more like condos, just a few steps from the beach that my husband and I rented 3 years ago. Since your accomodations are provided, you might enjoy the gorgeous walking trails they have that run near the beach and through dune-like sandy areas. It's hard to describe, but is worth a visit. (the website describes it as a "coastal forest") Some of my favorite pictures are from there. If I run across any this evening, I'll send you a couple. I highly recommend a visit to Grayton Beach. I don't know about Destin, but I live in AL about 10 minutes from I-65. If you need gas, there's a RaceTrac right off the interstate in Athens, AL that always has cheap, quality gas. Have a great trip! My header is from Destin- that is where we moved from a year ago. Actually Bluewater Bay which is on the other side of the toll road. There is a good thrift store called the Harvest House if you go 98W. Turn right on Marler St. This is down almost to the bridge going to Ft Walton. There is a big white church on the corner where you turn. The store is about a block back on the right behind the church. They have day old Krispy Kreme doughnuts and bread free with purchase. In the complex with Tuesday Morning there is a great Thai restaurant. The Back Porch is great for seafood. If you have time drive about 20 minutes to Seaside and Grayton Beach areas. Fabulous shopping and just fun to look at the cottages. A lot of expensive but unique shops for ideas. There is an antique store on 98 between main Destin and the outlets on the left called Bienville Antiques- it is fabulous. A lot of beachy shabby chic stuff that is full of great ideas. And Smiths- further down on the left. It is an antique mall that I could spend a day in just getting ideas- it is pricy and full of European antiques. Oh, you have to go to the Village at Baytowne Warf in San Destin. It is a shopping center designed like European cities small garden cafes and just a great atmostphere. We like to eat at ACME it has really good food each time we eat there. You can park and ride a ferry to the shopping area- the kids would like that. Have fun and wear your sunscreen. Oh, I wish I were headed back to Fl! Haven't been to Destin/Ft Walton in a few years but used to go almost every year!I always liked the cheaper (not upscale) antique stores, could browse for hours, and there's lots of outlet shopping in the area around San Destin. Stop in Ft Deposit, Al, at Priester's Pecans for the BEST pecan treats (candies, pies, and other yummy delights). It's just off the interstate. Have fun! I was going to also say that you should eat at Acme Seafood at Baytown Wharf...that is where I discovered that I like Oysters after all. I was going to recommend restaurant.com. Great minds think alike! "Free things to do in Destin". Do it for every town you'll be in, you'll find a lot of cool things. We love to visit city, county and state parks when we travel. I try to balance the paid things with a couple of free adventures. One more thing...my kids liked going to Gator Beach, and it's free! The regions’ only alligator attraction, Gator Beach offers a unique environment for viewing live alligators. There is no admission charge to Gator Beach and your family can participate in a free alligator show, too. Gator Beach features over 100 live alligators. Feed the alligators in a safe environment, from 11 AM – 5 PM daily. Stroll through the Florida’s wildlife exhibit area and have your picture taken while holding a live alligator. Gator Shows take place daily from 12 - 4 PM. Gator Beach is located at Fudpucker's in Destin." no advice, just wishing you a wonderful vacation! I've only been to Florida once for a whirlwind vacation, so I don't have any great advice. However, I did want to comment on your picture. That is absolutely priceless! I adore pictures of my son and daughter together, too. This is just precious! Everybody listed all the things I would have come up with...and more! I've camped several times at Grayton, and it's simple and beautiful. The Florida state parks bill themselves as the "REAL Florida," and I have to say I really love staying in the natural surroundings. We've seen beautiful birds and deer and a fox at the parks, and the beach is, of course, beautiful. I like that there's that long undeveloped stretch of sand to enjoy. And I've walked along the beach from Grayton down to Seaside. I'm going to take note of what your other readers have suggested! We like to visit the panhandle. For us, too, it's a straight shot down I-65. Have a great time and a safe trip! Try to get some needed rest too if that is at all possible. Most of all enjoy your visit with your family! What a sweet picture. I just love the big brother-little sister pictures you share. So sweet. Just a note about the photo, these moments are precious, I'm glad you have it on film. What a precious photo! Occasionally mine play nicely together, just need to have the camera handy! Sorry I'm way too far away from Florida to give any tips! Have fun though! I think I may need some of the same tips for my trip to Las Vegas. I get reimbursed, but I have to pay up front, Yikes! We went to Seaside once and camped at Grayton State Park. It's BEAUTIFUL and very well maintained. Seaside is interesting for adults who love architecture (my husband is an architect who specializes in town planning and urban design) - not sure there would be much for kids besides the beach, though! I don't know anything about Florida. I just wanted to say that the picture is precious. How wonderful to be going to Florida to get away from cold weather, although it must be warm where you are since your son has short sleeved jammies and your daughter has taken hers off! The picture is just precious and I hope you have a wonderful time. You should check out the Priesters pecan place that one reader recommended. If you aren't familiar with their products,they are fabulous (I almost get some at Christmas) and they give free samples at their facility! Enjoy the trip and eating in restaurants and splurging a little! It may be too early for the peach stand (obviously for peaches, at least), but Chilton County (between Birmingham and Montgomery, you'll see the giant peach) has a great farm stand with fruit, ice cream, the works. From what I remember, it's very reasonable and a great "stretching spot" along the way. Also, the Donut Hole is a very popular restaurant in Destin. Expensive for a full breakfast, but you can always get a few donuts to go on the cheap -- and they're quite good! We're also a fan of getting steamed shrimp/crawfish from places that sell to ship and eating on the beach... it's a huge moneysaver. I love that picture ! Such a sweet sight. Aw, I want to go to Destin! We honeymooned there (but it was not frugal!). We drove from Tennessee to Destin last summer and loved it! You and your husband will LOVE visiting the community of Seaside, near Destin. It is not a frugal place, but it is BEAUTIFUL to walk through. We enjoyed a wonderful bookstore on the central hub, and art gallery, I bought brown and white polka-dot shells, and the architecture is charming! Seaside also has weekly free kids movies shown after dark at the centralized outdoor amphitheater. As you can imagine, Wal-Mart and groceries in the heart of Destin are quite expensive. We saved quite a bit schlepping our own food, saving the big money for fresh seafood. Someone else mentioned the Fudpucker's gator place. Well, if you go, choose WELL BEFORE dinner hour or you will stand in line a lot. Have a great time! We are going down to Seagrove in May & I can't wait. We love the beaches down there. I'm sure you'll find plenty to do. Seaside is beautiful, but definitely not cheap, so go there for a walk & sightseeing. And of course, the beaches are the most beautiful! My daughter says "watch out for Jellyfish!" And she wishes she had gone on the glass-bottom seaboat tour with her cousins because they saw hammerhead sharks, stingrays and other cool things. You will be driving right by the peach place I wrote about on my blog, Durbin Farms. It is great stop if you need a break. Oh, and Deb is right about the jellyfish. My daughter got stung there last year. I don't know anything about Destin, but we are headed to Gulf Shores for the first weekend for our first time. We have that book! DS absolutely loves it. The best part? We got it at Borders on clearance! I have never been to Destin so I am no help there. When we go to FL it is to Cape Coral (SW FL) where my parents live. Enjoy the road trip.. I can't wait to see pictures!! Will the Easter bunny be visiting you in Florida? If so, will you take baskets pre-made with you or assemble them there? I found your blog today. I love the picture. 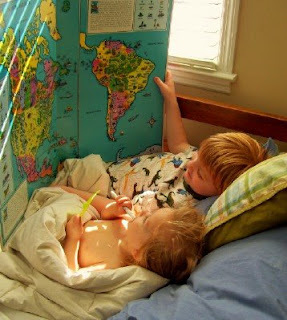 It reminds me of my kids when they took their first vacation but the were looking at a globe. I don't have any advice for Destin. I'm hoping to go there instead of Myrtle Beach this summer. They have really nice beaches! You know you have to stop at the Florida Welcome Center just inside the state line and get free orange and grapefruit juice! If you drive through Pensacola, the Naval base has a Naval Air Museum...cool things like dozens of old airplanes hanging from the ceiling. Plus it's easy to work in some age-appropriate history lessons as you look at the exhibits. Admission used to be free, but you might want to check that ahead of time because it's been 5 or 6 years since I was there. We lived in P'cola for about 5 years when my kids were small and they loved the museum. Cutest picture EVER! So adorable. Just beat you to a deal on a great bowl at Priester's Pecans! Pictures on my 03-13-08 entry. Peach Park is much better than Durbin Farms, if you're looking for somewhere to stretch your legs in Chilton County, AL. Awesome playground and a mean BBQ. No "Mennonite Markets" around here, but a tee-tiny store in Walnut Hill, Florida, Shirley's Country Collections. If you're planning to cut down to Pensacola through Atmore, it'll be on your right. Have fun trying to find deals! Enjoy the azaleas and try some great seafood! I meant my 03-12-08 post. You will be visiting not far from where I live! We took the little drive to Destin last year and it was great fun. We went on a dolphin boat called the Southern Star. It was so much fun to see all the dolphins. (FYI, the Destin dolphins do not migrate, so many dolphin boats have a guarantee that if you see no dolphins you get a full refund.) One of the places I like to visit while in Destin is The Fresh Market. It is a chain gourmet food store, but there is not one in the town where I live. So, Destin is my only chance to shop there. They have wonderful different types of flours, dried fruits, coffees and teas, and their bakery items are to die for! I hope you have a safe trip. My family and I have been going to Destin since our honeymoon 16 years ago. We always stay at the Ft. Benning Campground for military families; however, friends of ours have a camper and stay 10-15 miles past Destin at campgrounds that are near a restricted beach area...don't recall the name...but a shuttle goes from the campgrounds to the beach area which doesn't allow vehicles. The last year we went, the military beach was closed, so we loved walking the beach at The Crab Trap, my favorite restaurant; though it's expensive, we always go once, lunch is better than dinner on the pocketbook, but at dinnertime, the sun is setting. I wish I was there now! I live in Huntsville, Alabama so you'll be passing right through my town. The Space & Rocket Center is right off the interstate. If you have a few minutes and you're interested you can walk around the stealth bomber outside and the vertical replica of the Saturn V rocket. The original rocket is in a new building that you can walk around the outside. The park itself is rather expensive, but you can go in and check out the gift shop. There's loads to do in Huntsville, but most are pretty expensive in terms of attractions.